On 15 July 1410, the Battle of Žalgiris, or Battle of Grunwald, was fought. Lithuanian Grand Duke Vytautas (Witold; Vitaŭt) and his cousin, former Grand Duke of Lithuania, King of Poland Jogaila – Władysław II (Jagiełło; Jahajła), led the alliance of the Grand Duchy of Lithuania and the Kingdom of Poland against the Teutonic Knights, led by Grand Master Ulrich von Jungingen. Cousins decisively defeated the Teutonic Order. Knights would never recover their former power after the Grunwald. In 1230 the Teutonic Knights, a crusading military order, moved to Poland and launched the Prussian Crusade against the pagan Prussian clans. With support from the Pope and Holy Roman Emperor, the Teutons conquered and converted the Prussians by the 1280s and shifted their attention to the officially pagan Grand Duchy of Lithuania. For few next centuries, the Knights raided Grand Duchy, every year devastating its cities and lands. Despite being Christian, Kingdom of Poland suffered hardly from the constant Teutonic invasions as well. In 1385, Grand Duke Jogaila of Lithuania agreed to marry Queen Jadwiga of Poland. Jogaila converted to Christianity and was crowned as the King of Poland Władysław II Jagiełło. This marriage created a union between the Kingdom of Poland and the Grand Duchy of Lithuania. At the same time, the cousin of Jogaila, Vytautas, became the Grand Duke of Lithuania. On 6 of August 1409, Teutonic Grand Master Ulrich von Jungingen once again declared war on the Kingdom of Poland and the Grand Duchy of Lithuania. 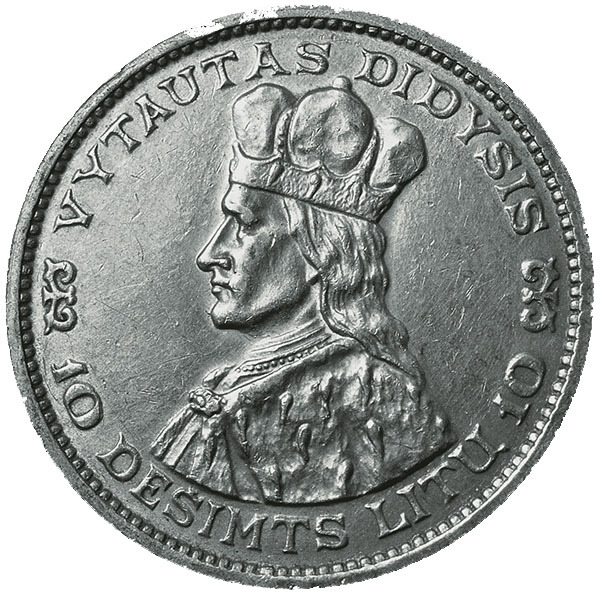 By December 1409, two cousins, Vytautas and Jogaila- Władysław II had agreed on a common strategy. 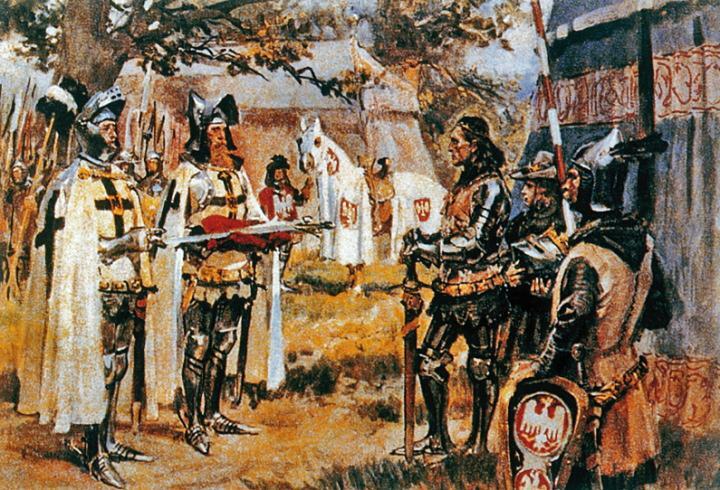 It was planned to unite their force and march together towards Malbork, the capital of the Teutonic Knights. 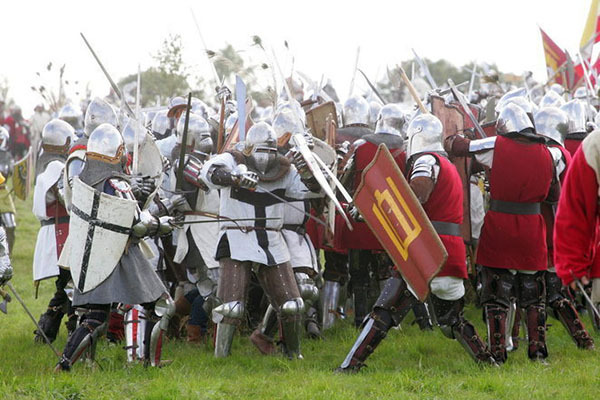 While less numerous, the Teutonic army had advantages in discipline, military training, and equipment. They were particularly noted for their heavy cavalry. The Knights also invited guest crusaders from Western Europe. Jogaila brought Poland troops along with mercenaries from Moravia and Bohemia. Serving among the Czechs was famous Jan Žižka, future commander of the Hussite forces. Vytautas gathered troops from lands of Lithuania, Belarus, and Ukraine and also contingent of Tatars cavalry. Interesting fact, that Vytautas actively participated in the battle himself, managing both Lithuanian and Polish units on the battlefield. Polish soldiers gathered in Poznań. Lithuanian troops marched from Hrodna and soon reached main Poland. 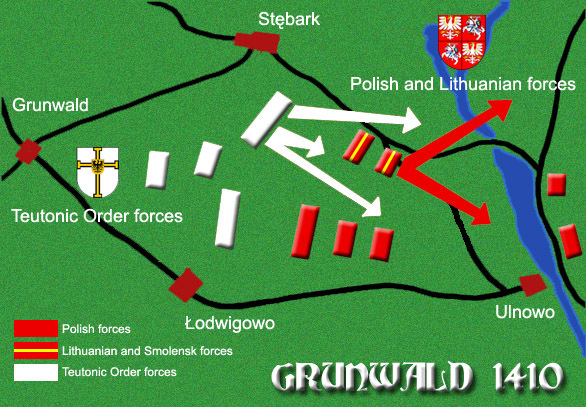 Both armies were united in Czerwinsk near the border with Teutonic Order and together invaded the Knights’ territory. In the early morning of 15 July, both armies met in an area between the villages of Grunwald, Tannenberg, and Ludwigsdorf. The Polish–Lithuanian army was positioned in front and east of Ludwigsdorf and Tannenberg. Polish heavy cavalry formed the left flank, Lithuanian light cavalry the right flank and various mercenary troops made up the center. The Teutonic forces concentrated their elite heavy cavalry, commanded by Grand Marshal Frederic von Wallenrode, against the Lithuanian troops. As cousins delayed, the Grand Master sent messengers with two swords to “assist Jogaila and Vytautas in battle”. The swords were meant as an insult and a provocation. Known as the “Grunwald Swords”, they became one of the national symbols of Poland. In the beginning of the battle, Vytautas attacked the left flank of the Teutonic forces. After heavy fighting, the Lithuanian cavalry began a retreat. Grand Marshal Frederic von Wallenrode assumed that victory was his, broke formation and started disorganized pursuit of the retreating Lithuanians troops. It was a key event of the battle, which finally decided its outcome. 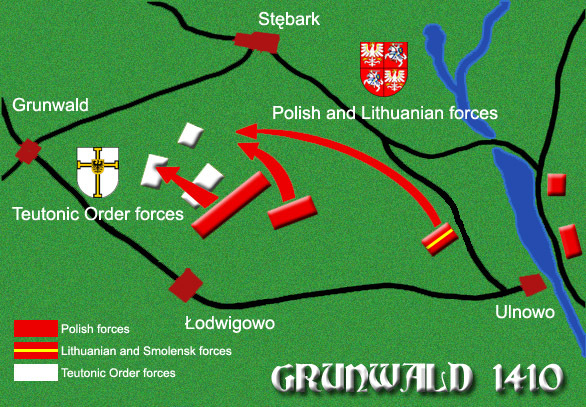 While Vytautas was retreating, heavy fighting broke out between Polish and Teutonic forces. It was the darkest time for the United army. At one moment, the Polish Royal Standard was lost and it seemed that Knights have almost secured the victory. However, King Jogaila deployed his last reserves and his Standard was soon recaptured. The battle was so tight, that one of Teuton knights, Lupold of Kökeritz, reached the King of Poland and charged directly against him. Fortunately, Zbigniew Oleśnicki, secretary of Jogaila, saved king’s life, gaining royal favor and becoming one of the most influential people in Poland. At the same time, the miracle has happened in the forest of Tannenberg. After entering the forest, retreating Lithuanian forces suddenly turned around. The disorganized elite Teutonic cavalry did not expect such a turn and was totally annihilated by Vytautas’ forces. Thereafter, Grand Duke reorganized his regiments and attacked the main Knights’ army from the rear. 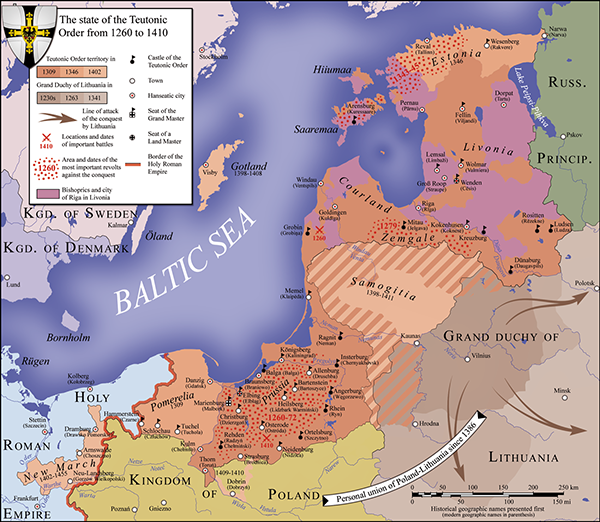 In the result, Teutonic forces were attacked from the both sides by now outnumbered Polish and Lithuanian armies. Teutonic Grand Master Ulrich von Jungingen attempted to break through the Lithuanian lines but was killed. According to Cronica conflictus, Dobiesław of Oleśnica thrust a lance through the Grand Master’s neck. 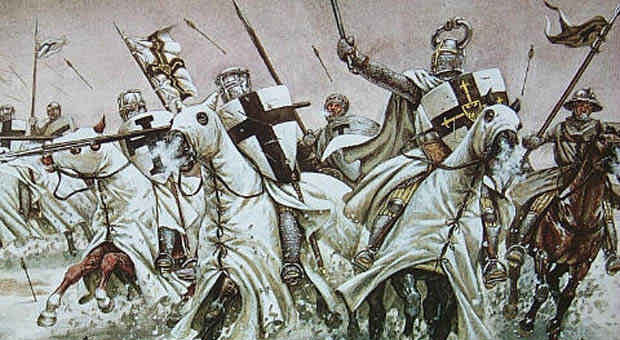 After losing both leaders, Teutonic Knights retreated. 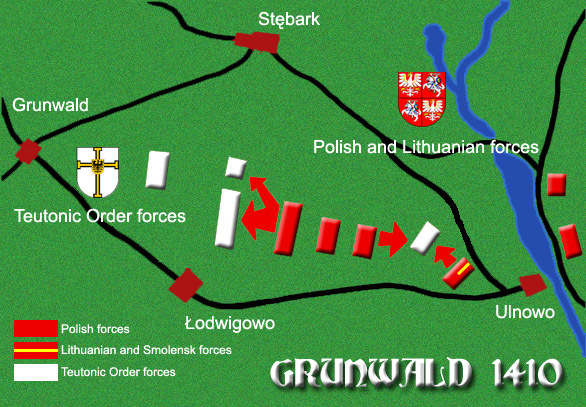 The main riddle and the object of discussions concerning the Grunwald battle is the maneuver of Grand Duke Vytautas. Was it, in fact, a real retreat or false opening gambit? Belarusian historian Vaclaw Lastowski in 1909, proposed that the retreat was a planned. This strategic maneuver was borrowed from the Golden Horde. A false retreat was used by the Tatars in the Battle of the Vorskla River a few years before. This time, Vytautas led army was dealt a crushing defeat. Grand Duke himself barely escaped alive. This theory gained wider acceptance after the discovery and publication of a German letter by Swedish historian Sven Ekdahl in 1963. The letter, written a few years after the battle, cautions the new Grand Master to look out for false retreats of the kind that were used in the Grunwald Battle. In any case, reorganizing his retreating or false-retreating troops and annihilating the most battle-worthy regiments of Teutonic Order, showed a great military talent and composure of Vytautas. The battle and victory of the allied Lithuanian and Polish troops over the Teutonic Order is depicted on one of the most famous Polish painting, “Battle of Grunwald”, painted by Jan Matejko. The painting focuses on the death scene of the Grand Master Ulrich von Jungingen. Another central figure is the “most valuable player” on the field, Lithuanian Grand Duke Vytautas, dressed in red with a raised sword, whose equanimity and talent was decisive in the outcome of the battle. Žalgiris or Grunwald shifted the balance of power in Central-Eastern Europe and marked the rise of the Polish–Lithuanian union as the dominant political and military force in the region for long years. The battle was one of the largest in Medieval Europe and is regarded as the most important victory in the histories of Lithuania, Poland, and Belarus because it finally put an end to never-ending invasions of Teutonic Knights on the territory of the Grand Duchy and the Crown.